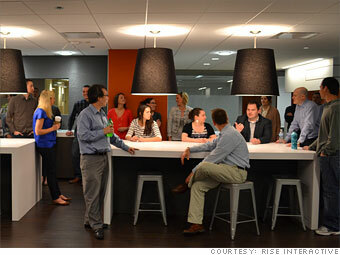 Rise Interactive in Chicago focuses on making websites more popular and profitable. The firm, whose clients includes companies like CVS-Caremark and ConAgra Foods, sprang from a business plan that then-MBA student Jon Morris submitted as part of a University of Chicago competition. The $10,000 prize served as startup capital for the firm. Morris chalks up Rise's impressive growth to a case of ideal timing. The company launched just as businesses in general began to recognize the potential of web marketing. Morris also made a smart move hiring financial analysts -- versus traditional marketing types -- who could offer clients solid website performance analysis. The move gave the company an edge over the competition. Morris may need a few more tricks up his sleeve to take on the growing ranks of competitors.